Looking back I appear to have been a little more meticulous when it came to keeping on top of my travel eating, with the exception perhaps of the two weeks in San Francisco, Napa and Vegas when I was overwhelmed by the sheer volume of posts that needed writing. Below are some forgotten bits and bobs from that fortnight, as well as a few strays from our trips to Hong Kong, Singapore, Bilbao and closer to home, Cheltenham and Oxford. 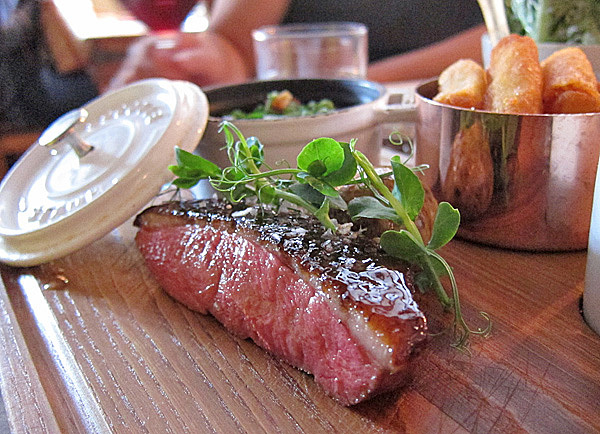 Daniel Patterson’s Coi is one of our favourite restaurants in San Francisco. His food is always elegant, considered, and impeccably sourced. There was much we liked from the Spring 2011 tasting menu – a rich velvety smoke-infused green garlic and goats cheese soup garnished with almonds and delicate wild onion flowers, tender seaweed-dusted asparagus tips cooked simply in their own juice served with lemon sabayon, and a sinfully good moscavado cake with sticky medjool dates and raw milk ice cream, to name a few. 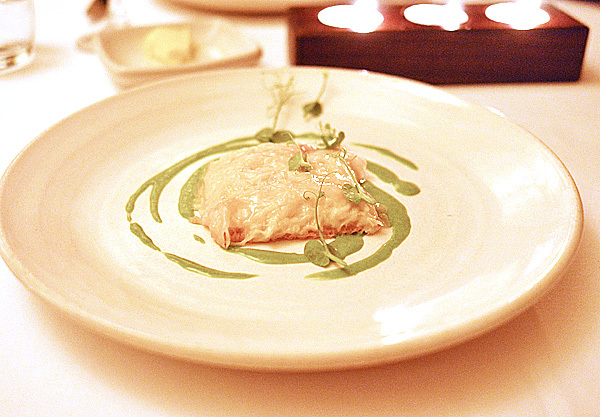 Most special though was the Crab Melt, California Style – thin crisp pastry slathered with a creamy crabmeat and melted lardo, served with a swirl of wheatgrass purée. For us, nothing beats French Laundry in nearby wine country. Sadly our most recent jaunt in Napa didn’t include a stop at Keller’s hallowed establishment. We did however dine at the other 3* in the area, Meadowood which paled in comparison as well as Michael Chiarello’s Bottega where we enjoyed a relaxed supper of pasta (Black Pepper Bucatini alla Carbonara with soft cooked duck egg, guanciale, parmigiano crema and shaved asparagus and Spinach, Ricotta and Egg Yolk Gnocchi Raviolo with black truffle and sage brown butter were to die for), fall-off-the-bone Smoked Braised Short Ribs, and gorgeous warm Zeppole (Italian doughnuts) served with Lemon Curd and Blueberry Earl Grey Jam. 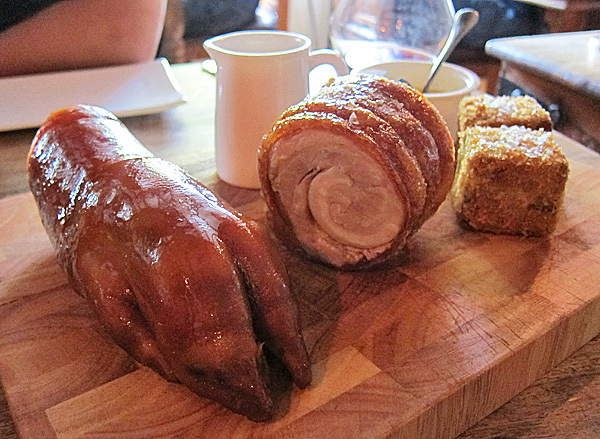 Annoyingly we swapped a Sunday brunch reservation at Ad Hoc for a disappointing one at Redd. A starter of Hamachi Sashimi (with sticky rice, edamame and lime ginger sauce) was pleasant but Shrimp and Pork Potstickers were a poor Americanised imitation. 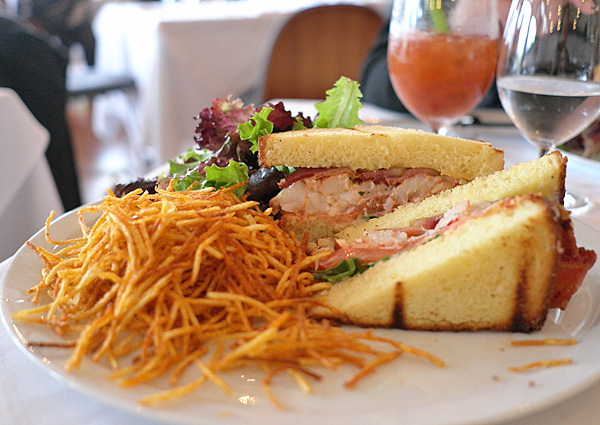 The Lobster Club Sandwich wasn’t bad, but needed higher lobster to bread ratio as the thick slices of buttery brioche completely overshadowed the sweet shellfish. 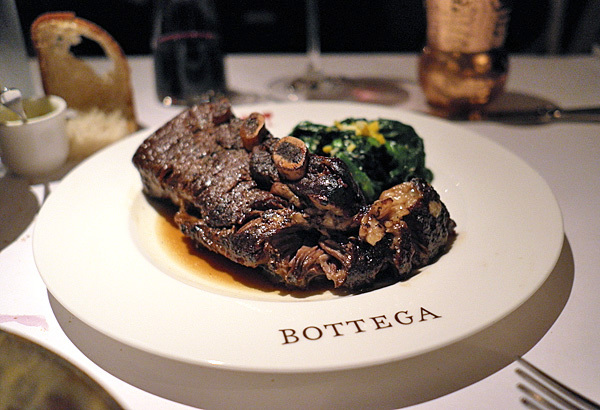 We do love Vegas, and the eating is a large part of why. Super-sized breakfasts at Hash House A Go Go, towering plateaux de Fruits de Mer at Bouchon, gigantic crab claws at Joe’s Stone Crab and fast food Burgers worth queuing for (we preferred Fatburger to In-N-Out). 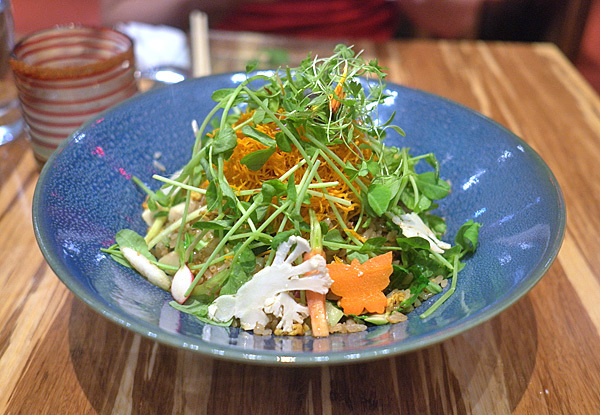 I can’t locate a single photo of any of these (too busy chowing down) but I do have a shot of the fantastic Twenty-Vegetable Fried Rice at China Poblano, one of the healthier casual eats we had on our stay. I’d usually be the last person to rave about a meatless rice dish, but this had a great balance of textures and flavours from the mix of raw and cooked veggies and fabulous “wok hei” (aroma from the heat of the wok). We didn’t order any of the dim sum from the Chinese and Mexican street food menu but the tacos we sampled from the extensive selection were all good. 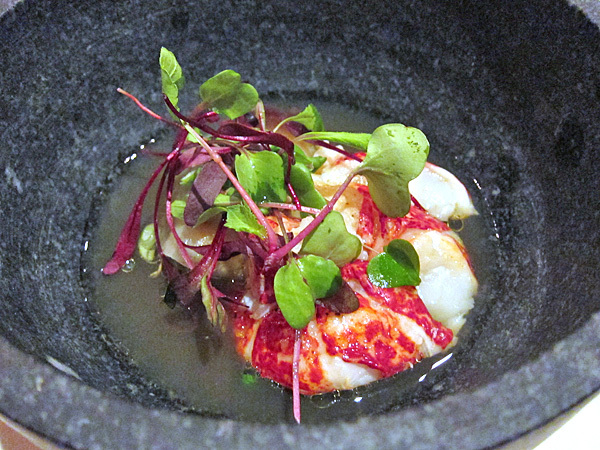 Naturally we also ate at numerous restaurants on the other end of the spectrum – higher end places like Joel Robuchon, Guy Savoy, Michael Mina, SW Steakhouse and Bartolotta. But our most memorable meals to date were both at é by José Andrés, a secret 7-seater restaurant within Jaléo in the Cosmopolitan Hotel open 3 nights per week and bookable only via email (a month to the day). Each of the multitude of courses on the surprise degustation were plated and served to us by the chefs from behind the counter of our bar seats – delightful tidbits such as Caramelised Pork Rinds, Crispy Chicken Skin in Escabeche (mind-blowing) and Bocata de “Calamares”, a miniature take on a traditional squid Spanish sandwich (on our second visit the filling of squid and prawns was replaced by sea urchin – needless to say it was AWESOME), and larger plates of Turbot with Bone Marrow and Secreto of Iberico. 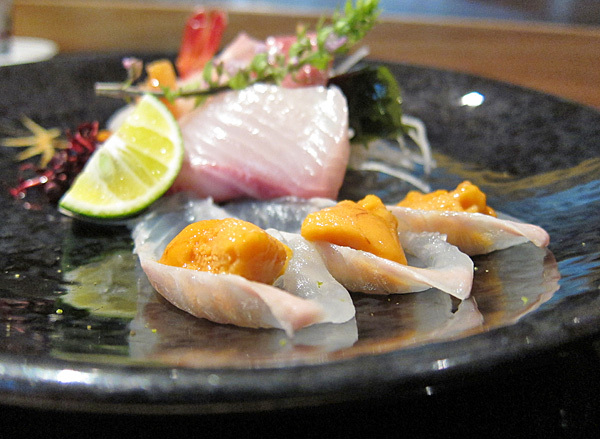 I’d say that, and Raku just off the Strip (their 15-course kaiseki is fantastic) are the two spots worth splashing your cash at in Sin City. In May we hit Spain and ate our way around Barcelona and San Sebastian, pausing in Bilbao along the way. There we checked out the Frank Gehry-designed Guggenheim and popped Pintxos (the Basque region’s answer to tapas) at Gatz and Irrintzi. The former is a hugely popular bar offering traditional bites like anchovies, bacalao and tortilla, all on bread slices. 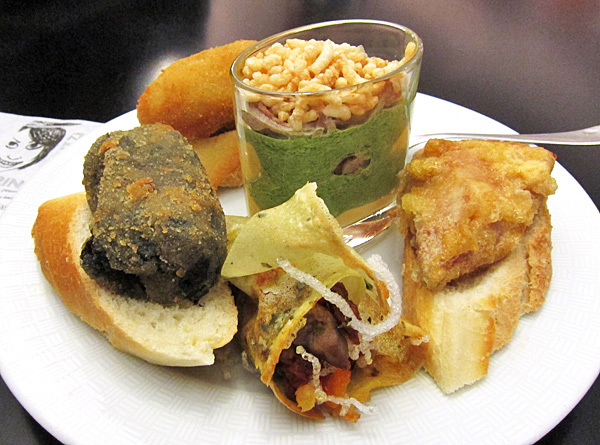 The latter, also on Calle Santa María and right next door, shows more creative flair (with items like squid ink croquettes and frog leg brochettes), has a funkier café feel and attracts a younger clientele – it was swarming with teenagers on our visit. 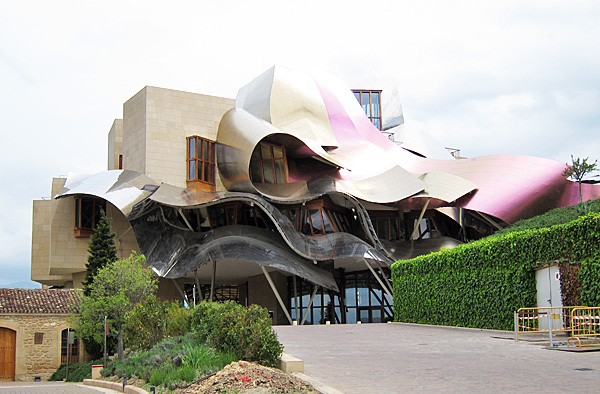 We also spent a night at the Marqués de Riscal Hotel, another dramatic Gehry masterpiece in Elciego, a medieval town in Rioja halfway between San Sebastian and Bilbao. We took a tour of the surrounding winery and vineyard (very commercial, tedious and frankly a waste of time), luxuriated at the Caudalie Vinothérapie spa, were pleasantly surprised by Francis Paniego’s modern Riojan cuisine at the on-site restaurant, and drank cava from a very cool bottle. June’s trip to Singapore was pretty laid back and was all about catching up with family and friends. 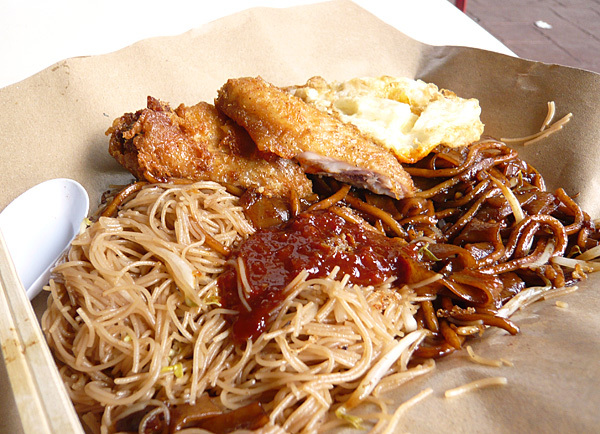 My folks place is near Ghim Moh Market which meant there were hawker breakfasts aplenty – fish ball noodles, mee pok, nasi lemak, chee cheung fun and fried beehoon/kway teow with fried eggs and chicken wings. Yum. That’s not to say I didn’t make time for non-street fare. Off hand I recall exquisite Foie Gras Xiao Long Bao and Crab Bee Hoon at Sky on 57 atop the Marina Bay Sands, beautifully-crafted kaiseki served by kimono-clad waitresses at Goto (we always eat here at least once when in town) and a tip top omakase sushi and sashimi lunch at Tatsuya followed by quality java at Papa Palheta. A brief stop in Hong Kong on our way back to London saw us eating up to the very last minute, as we almost missed our flight when we slotted in an eight course meal at Xi Yan Private Dining before dashing off to catch the Airport Express. The cooking was not as fine as that of Lung King Heen or Tim’s Kitchen, but there were some pretty tasty dishes. 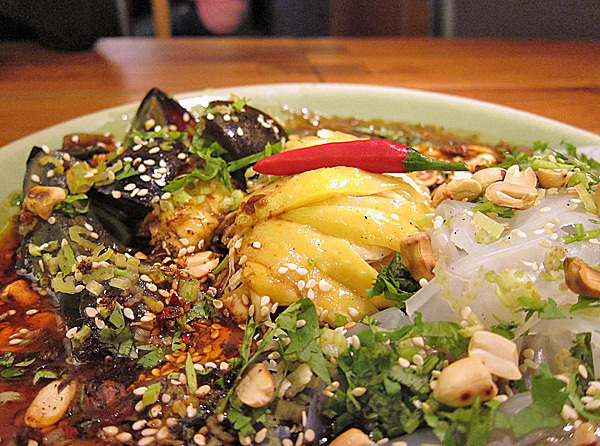 Highlights include Osmanthus Smoked Duck Egg with Crab Roe, Crispy Stuffed Duck with Glutinous Rice, and fiery Sichuan Chicken served family-style with gooey jellified chunks of century egg and slithery glass noodle ribbons. Back in UK we took advantage of the unusually long summer and made a few short food-centric road trips. 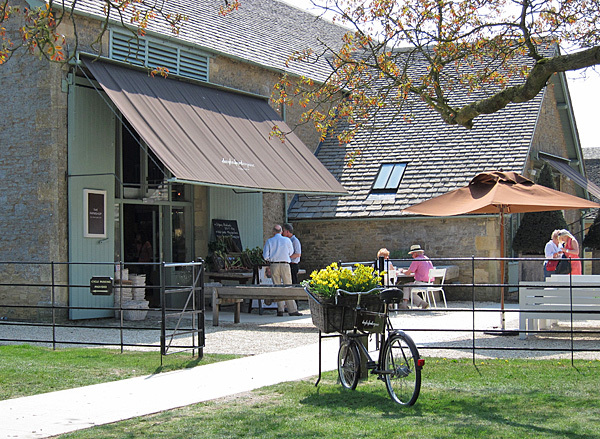 We had a wonderful alfresco lunch at the Daylesford Farmshop and Café in Gloucestershire. Nothing fancy, just simple honest food (potted mackerel, beef tartare, crisp breaded Laverstoke Park pork and a juicy grilled burger) prepared with local organic produce in really pretty surroundings. We’ve heard lots about David Everitt-Matthias’ food and love his cookbooks so were excited to eat at his 2 Michelin-starred restaurant Le Champignon Sauvage in Cheltenham. Perhaps our expectations were too high, but despite some solid dishes (namely Lobster with Thai Spiced Bouillon and ‘Cramique’ Perdu with Caramelised Apples and Toasted Almond Ice Cream) our dinner there failed to dazzle. Instead we were much more impressed with the unstarred Lumière a stone’s throw away. A long weekend in the Cotswolds with friends led us to Cherwell Boathouse in nearby Oxford. 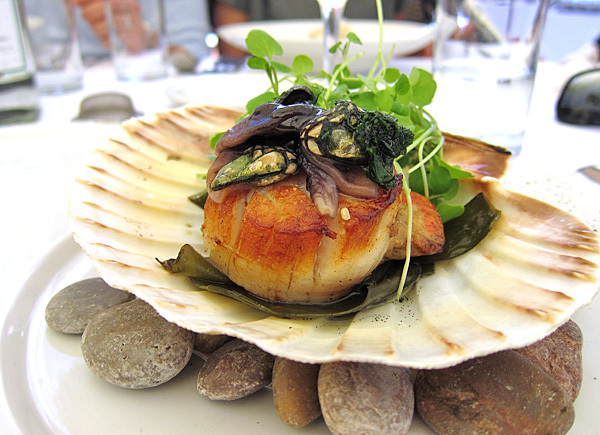 I had originally chosen the restaurant as it was baby and dog friendly (our group had two newborns and a schnauzer in tow) but the food was actually great – I was particularly impressed by a starter of seared Scallop with Goose Barnacles. Its riverside setting is idyllic too, and one can take a post-lunch punt down the Cherwell River if the whim so takes them. Driving home from Woodstock we took a detour through Marlow to meet a friend for lunch at The Hand and Flowers. To begin, the three of us shared Truffled Pork Terrine, Roast Veal Sweetbreads and Moules Marinières with Warm Stout – all very nice. For mains we picked the winning dishes from the Great British Menu – Slow-Cooked Duck with Peas, Duck Fat Chips and Gravy (2010) and Roast Hog with Salt-Baked Potatoes and Apple Sauce (2011) which were also solid. Deserving of one Michelin star? Yes. Two? I’m not so sure. If I were to compare to fellow 2* recipients it just wasn’t of the same calibre with regards to service, ambience or food. And that wraps up 2011 (just in time for Chinese New Year!) – here’s to another year of eating well, drinking lots and general good times. 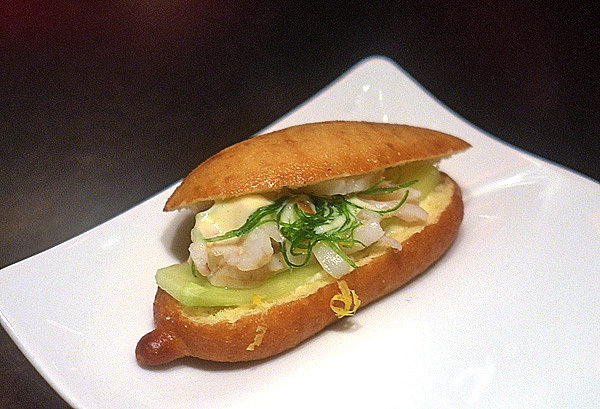 ~ by gourmettraveller on January 23, 2012. Thanks Kavey, look forward to reading about your travels ahead! Kung hei fat choi! Blimey you’ve been eating well – fantastic post. Happy CNY to you too Lizzie! Thanks, yes it does look like quite a lot when I bundle it all up in one post!